I’ve been warning investors for months that a correction was coming. In fact, I recently had my readers take profits on many of our stock positions to prepare for a pullback. I also had them buy one of the safest assets in the world: gold. Gold has historically performed well when the stock market falls. Investors often pile into gold because of its “safe haven” status. But as I know you’ve heard, the Federal Reserve is raising interest rates. And you’ve probably also been told that rising interest rates are bad for gold. While I understand the logic, the data simply does not support the argument. The thinking on gold and interest rates is that when rates rise, investors will earn a higher yield on government bonds. Let’s say that you buy a 10-Year Treasury note that pays 3% per year. That’s double what the same bond was paying only two years ago. Gold, on the other hand, does not pay any yield. It logically follows that investors will pull money out of gold and put it into yield assets like government bonds. And that would be bad for gold. The Federal Reserve has been hiking rates since late 2015. That means that gold prices should perform poorly. But the data tells a different story. The rise of one thing as another thing falls is known as a negative correlation. Real world data, however, shows that gold and interest rates rarely move like that. 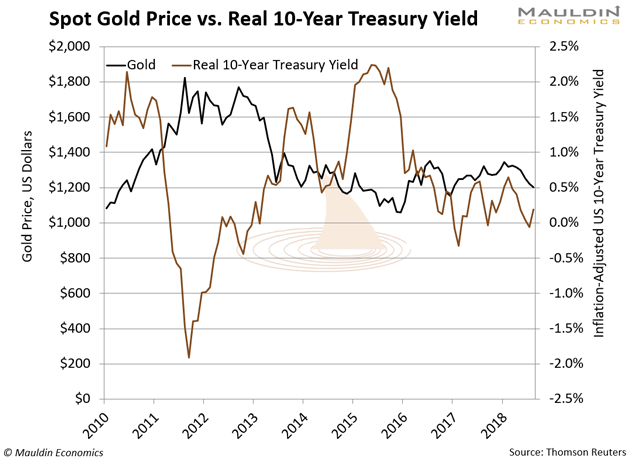 According to market research firm Pension Partners, gold and 10-year Treasury yields have shown negative correlation only 44% of the time since 1920. Since 1970, the two assets have shown a negative correlation only 28% of the time. The record tells us the belief that gold must fall as rates rise is weak at best. But let’s take a closer look at the history of gold prices and interest rates. Gold was in a major bull market in the 1970s. In fact, the price of gold rocketed from $50 to $835 during this period. That’s a 16-fold increase in under 10 years! But hold on, because interest rates were on the rise during this period as well. In 1971, the 10-year Treasury note hit a low of 5.5%. By 1981, the same interest rate jumped to 16%. If anything, this period shows that gold and interest rates often rise together. Here’s another example. While the 1970s saw the rapid rise of interest rates and gold prices, the 1980s was the exact opposite. The 10-year Treasury yield peaked at 16% in 1981. By 1986, the same yield was more than halved to 7%. And it was a similar story with gold. After its 1980 peak at $835, the price of gold slid to $335 in 1986. Yet again, interest rates and gold moved together. We saw this same trend play out recently as well. Since 2010, real interest rates have been stuck near 0% and gold did poorly. Other than their negative correlation in 2012, gold and rates have moved without any rhyme or reason for nine years. And that happened with real rates near zero. Clearly, the correlation is not as tight as many believe. In fact, it may be the exact opposite of what many investors believe. The relationship between gold and interest rates is muddy. However, the relationship between interest rates and stock prices is clear. Many companies sell bonds to raise money to fund their businesses. The interest paid on corporate bonds is closely tied to the interest rate on government bonds. So when government interest rates rise, so does the interest rate companies have to pay on their corporate bonds. This means companies have less money to invest in their businesses. In step, this lowers their earnings—and their share prices. It’s clear: Higher interest rates are bad for stocks. What’s also clear is that gold tends to perform better during periods of stock market weakness. We’re currently in the 155th month of the bull market in stocks. That’s the longest bull market in US history. We’ve seen stock prices become much less stable in the last few weeks. And rising interest rates is the main reason behind the stock market weakness. I always keep 2% of my investible assets in gold. But during times of rising interest rates, I double this allocation to 4%. My preferred way to add gold exposure is to own the SPDR Gold Shares (GLD) ETF. So no matter what you do, make sure to add gold to your portfolio. And above all else, don’t let rising interest rates deter you from doing so.